Woks of Life had this really great looking Eggplant with Garlic Sauce recipe. I would highly recommend going to their site to find the recipe. They have amazing pictures, unlike my crappy ones. And detailed instructions. My version is basically the same with minor adaptations. 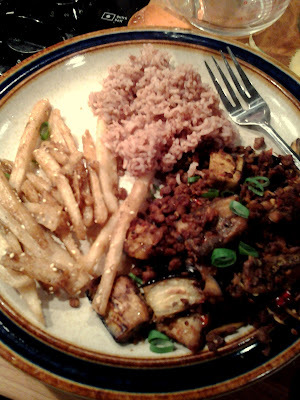 adapted from Woks of Life, "Eggplant with Garlic Sauce"
1. Heat a tablespoon of oil on high heat and add half the eggplant. Sear it all around, maybe 5 minutes. Then repeat with the second batch. 2. Heat the third tablespoon of oil and add the meatless ground beef and the ginger. Once the "meat" starts to brown, add the garlic and red pepper. 4. Top with scallions and serve with rice. I could literally eat this every day. I also served it with Dry Fried Lotus Root. You can find the recipe in Phoenix Claws and Jade Trees: Essential Techniques of Authentic Chinese Cooking , which for the record is amazing. You can turn most of the recipes into vegan versions. You probably don't have a lot of these ingredients. I do, because I practically live at HMart. But I included a bunch of Amazon Affliate links for some of the stuff. Everything's online people, don't let unusual ingredients stop you from trying new things! Eggplant is one of my favorite foods but my go to is always Parmesan. I'm trying this!